Turquoise is the birthstone of December. It is one of the first ever gemstones to be mined and has long been prized for its intense colour. 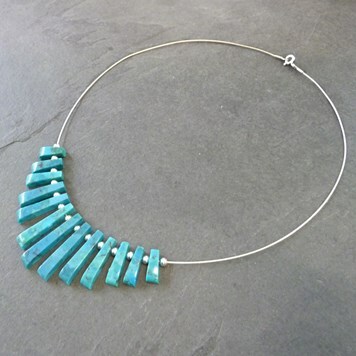 Turquoise is a widely available stone, however it is rarely found in its pure, natural form. It has a rich history with many interesting properties. Colour: Sky-blue, blue-green and apple green depending on the quantities of iron and copper within it. The most prized colour is the typical Robin egg blue colour. 'Sleeping Beauty Turquoise' is a pure blue colour and is very sought after. It wasmined in the 'Sleeping Beauty Mine of Arizona, USA which has now closed. Persian turquoise also has this bright sought after colour. 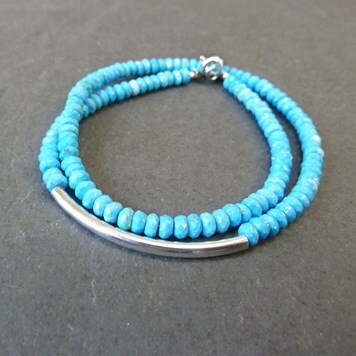 A lot of turquoise such as Chinese turquoise contain matrix - brown, black or grey veins, which is part of the host rock which the turquoise has grown amongst. Appearance: The birthstone of December is an opaque to semi-translucent stone, light and very fragile. It is commonly found in microcrystalline, a material formed of microscopic crystals. On fresh fractures it has a waxy or vitreous luster. Rarity: In its natural form Turquoise is very rare and accounts for less than 3% of the turquoise available on the market. However stabilised Turquoise is much more common. 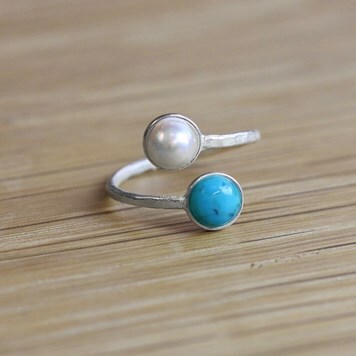 This is when the stone has been treated in some way to deal with two main problems that is associated with a lot of Turquoise, its softness and porousness. The most common form of stabilisation is with a clear epoxy resin. The resin, under pressure, absorbs into the rock, which permanently hardens the rock making it harder and more suitable for use in jewellery. Another common form of Turquoise on market is colour enhanced and stabilised Turquoise and reconstituted Turquoise, which is becoming more common as good quality Turquoise rough material gets harder and harder to find. To read more about the different kinds of Turquoise on the market Click Here. Moh's Scale Hardness: 6 - a relatively soft stone. Sourced: United States, Egypt, Mexico, China, Iran, Peru, Poland, Russia, France, Tibet, Egypt, Afghanistan and Arabia. As water moves through porous rock, minerals are dissolved, such as copper, aluminium and iron. Over a long time, these minerals accumulate in pores and cracks to form deposits of the material we know as Turquoise. The colour of the stone varies depending on the amount iron and copper present. The name Turquoise is said to derive from 'Turkish stone' because the trade route that brought it to Europe came via Turkey. 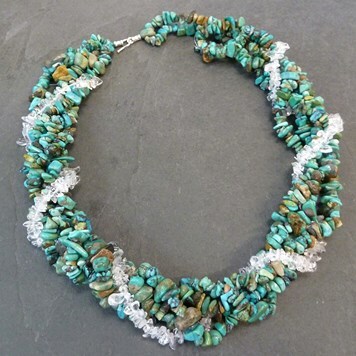 Turquoise was being mined by 4000 BC and being used for jewellery, amulets and in preparation for cosmetics. 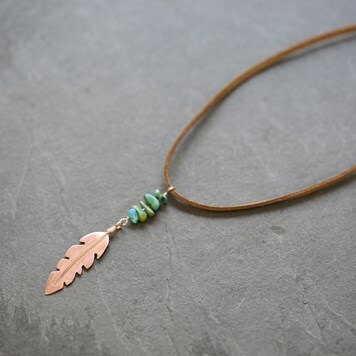 Turquoise is thought to be a protective stone that has been used for amulets for centuries - an amulet is a small piece of jewellery thought to give protection against evil, danger and disease. It is said to dispel negative energy and provide protection against pollutants in the environment. The birthstone of December is also thought to enhance intuition, as well as release inhibitions and prohibitions which allows the soul to express itself. It is a promoter of self-realisation. 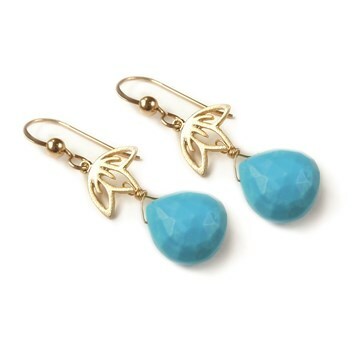 Turquoise is also said to assist creative problem solving and calming the nerves when speaking in public. 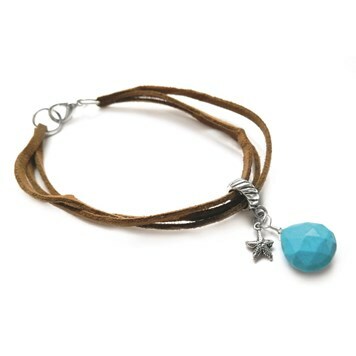 Physically, Turquoise is said to be an excellent stone for exhaustion, depression and panic attacks. It is thought to enhance the physical and physic immune systems, regenerate tissue, support the assimilation of nutrients, alleviate pollution and viral infections and heal the whole body. 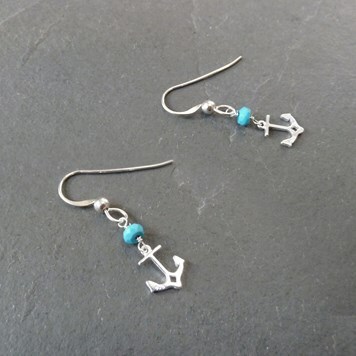 We love Turquoise here at Kernowcraft and have a large variety of types. This includes Turquoise, Matrix Turquoise, Chinese Turquoise and Tibetan Turquoise. We also stock these varieties in a number of different products. For example, gemstone cabochons, beads and briolettes. To shop our variety of Turquoise gemstones Click Here. 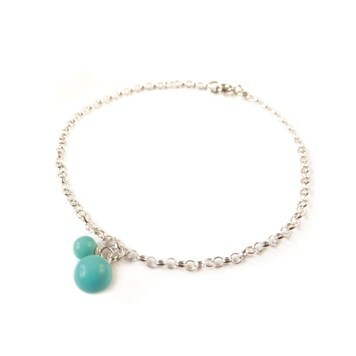 Within our Make The Look section we have a number of jewellery design tutorials using a few of our Turquoise products. Each easy-to-create look would make a unique and beautiful birthday presents for anyone who's birthday falls in the exciting month of December... or they would equally well as a personal handmade Christmas gift. For step by step instructions on how to create any of following jewellery designs, click on their image or click here to see all our Make The Look design projects. Our projects have easy to follow instructions and a simple one click to order shopping list. 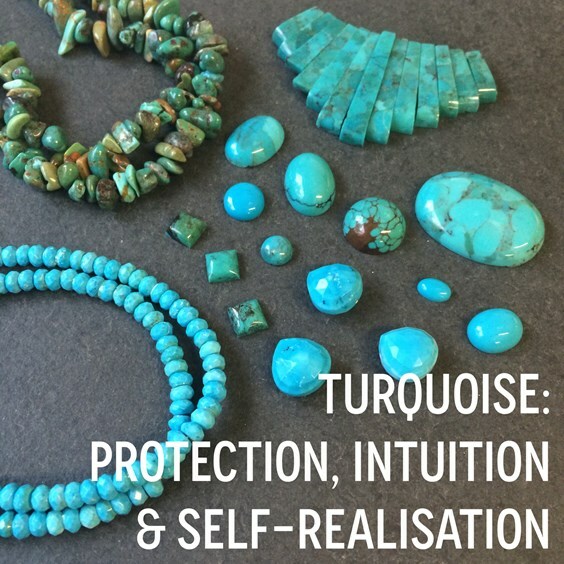 To learn more about Turquoise check out our 'All About Turquoise' page where we explain the different types of Turquoise found on the market.